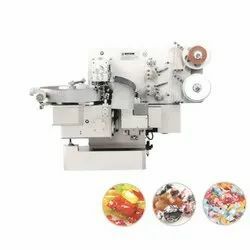 Pioneers in the industry, we offer automatic ball lollipop twist packaging machine, multifunction automatic packaging machine ld-cy, automatic toffee double twist packaging machine, multifunction candy forming machine and multifunction rotary cutting and forming machine from India. Purpose: It is Suitable for twist packaging of ball lollipop . * Automatic sugar rationing device, with a novel structure, beautiful appearance, low noise, stable operation, easy maintenance. *AC motor attached inverter, variable speed control. * Fully automatic computer control, photoelectric color tracking. *International advanced photoelectric sensor detection, two-way tracking, with tracking fast, accurate pattern, which can effectively eliminate the packaging error. * Food contact parts made of stainless steel, easy to clean, in line with health requirements. Uses: Applicable to the packaging of candy and other solid items with regular particles, such as rectangular, square, round, spherical, cylindrical, oval and so on. Features: Servo photoelectric tracking, frequency control, fault diagnosis, smooth operation, easy operation and easy maintenance. Uses: It is suitable for double twisted knot package with regular candy, such as oval shape, cylindrical shape, spherical shape, waist shape, rectangular shape and so on. * Easy to operate, high efficiency, save labor, smooth operation, low noise, easy maintenance. *The main core components imported new high-precision wheel intermittent segmentation and cam transmission mechanism, so that each move Bo accurate place. * AC motor attached inverter, variable speed control to achieve high precision, energy saving and increase service life, while running can be dynamically adjusted. *Fully automatic PCL computer controller, the international advanced photoelectric sensor detection, photoelectric detection, two-way tracking, tracking with fast, accurate patterns and effectively eliminate the packaging error and other functions. *with overload protection, leakage protection, no membrane alarm and other functions. *Food contact parts made of stainless steel, smoothness, easy to clean. 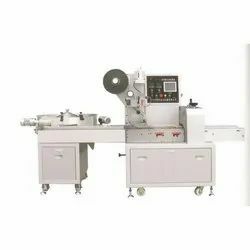 *can use single or double packaging film, can be configured to automatically hopper. 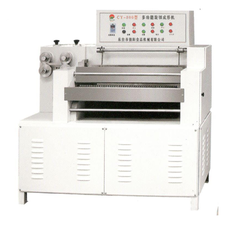 Uses and characteristics: The machine is unique in design, using closed mold, one-time stamping, can produce sandwich candy (candy), sandwich hard candy (hard candy). Solve the problem of irregular shape in the production of the original domestic chain molding machine. Stamping, smooth operation, high output. Candy shape: suitable for the production of hard candy, sandy candy, taffy and sandwich candy, but also for the production of candy heart candy (candy shape can be according to customer's requirements), for example: spherical, oblate , Oval and a variety of shaped. It is suitable for production of cylindrical, spherical and other various regular candies with diameter of 12-25mm. It has such features as combination of variable frequency speed control and pneumatic driving, high speed, high output and low fault rate.